The Center for American Progress is the country's most prominent liberal think tank. But it isn't just buddy-buddy with Democratic elites like the Clintons — it's cozy with AIPAC and right-wing leaders like Benjamin Netanyahu. In front of a crowd of thousands at the AIPAC Policy Conference on March 26 in Washington DC, one speaker after another took turns condemning progressive Democrats. If there was a theme to the day’s programming, it was to use the Left, and in particular the embattled freshman Rep. Ilhan Omar, as a boogeyman and a punching bag. Mitch McConnell, the Republican Senate majority leader, intoned about the “growing tide of antisemitism and anti-Israel sentiment” in the Democratic Party. Speaker of the House Nancy Pelosi bragged about using the allegations of antisemitism against Omar to justify a House bill against the “antisemitic myth of dual loyalty.” Israeli prime minister Benjamin Netanyahu, on a fuzzy livestream from Israel, directly called Omar an antisemite. As far as AIPAC-friendly issue experts go, Herzog is fairly tame. Not particularly far to the right, most of his public writing expresses either a quiet concern about the threat Iran poses to Israel and other American allies in the region, or offers vanilla policy prescriptions to maintain the status quo of Israeli military control over Gaza and the West Bank. Previously a chief of staff in the Israeli Ministry of Defense who worked in negotiations with Palestinians, he presently serves as a fellow at the Washington Institute for Near East Policy, an influential policy shop reportedly founded by AIPAC officials. But the Herzog event reflects CAP’s ambivalence about pursuing a progressive foreign policy and its repeated willingness to partner with reactionary foreign governments, including Israel, India, and the Persian Gulf monarchies. “As a research institution, CAP regularly holds both private and public discussions on a variety of topics — including America’s approaches to foreign policy,” a CAP spokesperson told Jewish Currents over email, noting that the group hosted Ilhan Omar in February and that the AIPAC-Herzog event “was just one in a series we have hosted on Middle East policy, including a recent public event on the Trump administration’s approach to Palestine.” A representative for AIPAC did not respond to a request for comment. CAP was conceived in the early 2000s by former Clinton administration officials as the Democratic Party’s answer to explicitly right-wing think tanks like the Cato Institute, the American Enterprise Institute, and the Heritage Foundation. CAP’s sister organization, the CAP Action Fund, with which it shares staff, is a 501(c)4 advocacy group that engages in more explicit lobbying work and houses the ThinkProgress blog and newsroom, which ostensibly operate independently of CAP. Taken as a unit, CAP and its Action Fund comprise the largest institution of liberal policy thought inside the Beltway, and its alumni can be found all across Democratic offices on Capitol Hill and in the ranks of Democratic 2020 presidential campaigns. Though much of CAP’s funding has come from philanthropic sources with conventionally liberal profiles — for example, George Soros, the Sandler Foundation, and the Ford Foundation — the institution has long faced criticism from the Left over its corporate funding sources and the close proximity of its leadership to the Democratic establishment. CAP’s chief executive, Neera Tanden, and its board chairman, John Podesta — both Clinton administration alumni — were senior advisers to Hillary Clinton throughout her failed 2016 presidential campaign. And on issues related to the Middle East, CAP has worked hand-in-hand with right-wingers and representatives of illiberal governments, such as Saudi Arabia and the United Arab Emirates. In recent years, such governments have increasingly relied on funding think tanks like CAP as part of their lobbying efforts in Washington. 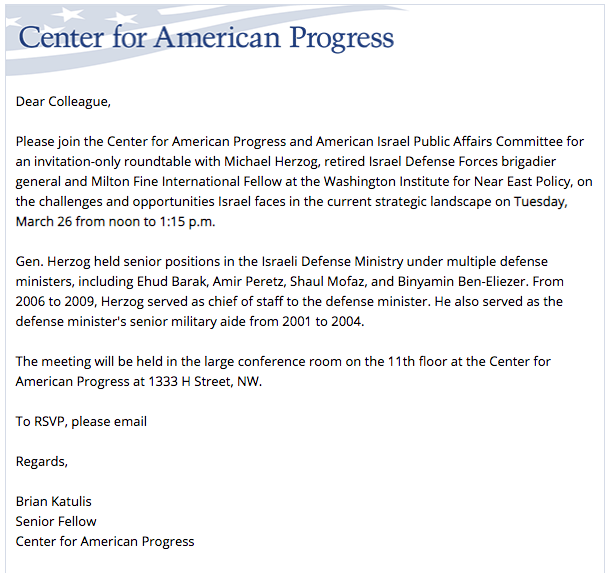 Brian Katulis, the CAP senior fellow responsible for the Herzog-AIPAC event, is a case in point. In 2017, Katulis worked with Ilan Goldenberg, a fellow at another national security think tank influential in Democratic circles, the Center for a New American Security (CNAS), to organize a trip to the United Arab Emirates (UAE), the details of which were revealed in a 2017 report by The Intercept. According to leaked emails obtained by The Intercept, the trip cost around $150,000 and was paid for by the UAE government. After firing two staffers suspected of leaking the emails to The Intercept, CAP said in late January that it would no longer take funding from antidemocratic governments. While the UAE “funding never impacted any CAP position or policy,” a spokesperson told the Guardian, “everybody here agrees it’s just the right thing to do.” Before cutting ties, CAP admitted to having taken between $500,000 and $1 million from the UAE government. When it comes to progressive criticism of the Israeli occupation of Palestinian territory, CAP has shown a similar willingness to buckle to outside pressure. 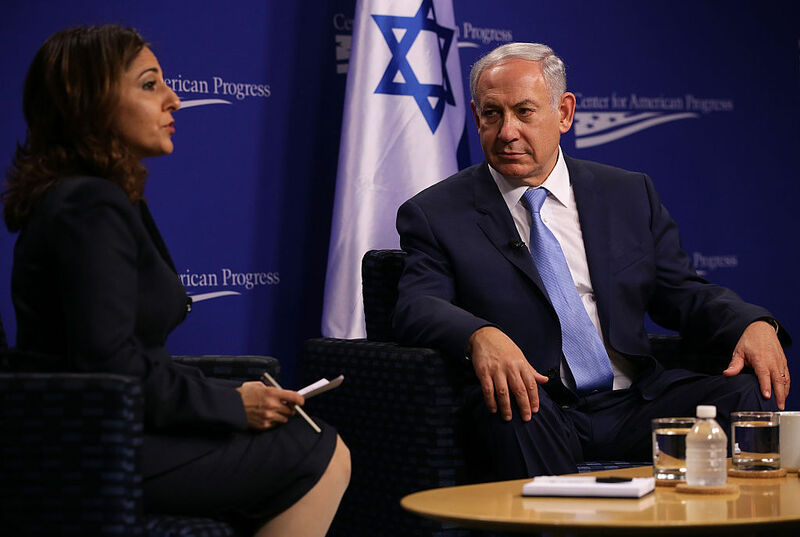 Though CAP maintains that ThinkProgress operates with editorial independence, former staffers have repeatedly insisted that they were instructed to avoid criticizing the Israeli government. A former editor claimed in a Twitter thread on Sunday that in late 2011 and early 2012, CAP senior leadership barred ThinkProgress staffers from mentioning Netanyahu. The alleged censorship was a direct response to a right-wing campaign organized by a former senior AIPAC official to paint ThinkProgress’s reporting and commentary as antisemitic. Further emails leaked to The Intercept show that Israel lobby activists (including Hillary Clinton loyalist Ann Lewis) successfully pressured Tanden to urge her staffers to back off Israel coverage. Over this past weekend, criticism of CAP’s closeness to establishment Democratic politics, an undercurrent of the 2016 Democratic primary fight between Hillary Clinton and Bernie Sanders, once again spilled out into public view. Sanders’s current presidential campaign released a letter accusing ThinkProgress of “counterproductive negative campaigning” against Sanders and other Democratic candidates. This criticism hits particularly close to home: ThinkProgress founder Faiz Shakir is now Sanders’s 2020 campaign manager, and Sanders’s Senate foreign policy chief, Matt Duss, was previously a ThinkProgress blogger and CAP staffer. Duss has personally accused CAP of interfering with ThinkProgress’s editorial independence during his time there, specifically with regard to critical coverage of Israel.